Gluten Free, Grain Free and Delicious. By Nature. Prepare Chebe Mix as directed, be sure to knead dough thoroughly. Portion the dough evenly, approximately 10-12 dough balls. Roll each ball into a long thin breadstick, approx. 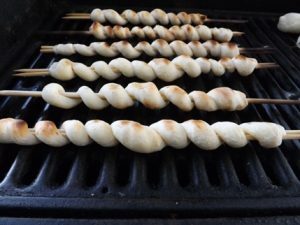 10-12"
Using a wooden or metal skewer, attach the dough on one end. 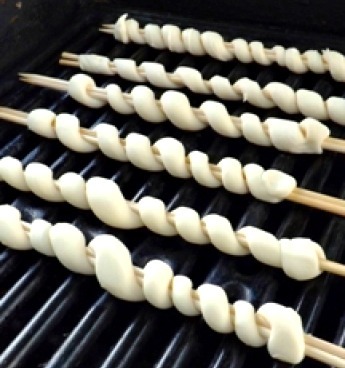 While turning the skewer, allow the dough to spiral up the skewer, like a candy cane, and attach at the other end. To Grill: Place on pre-heated grill. 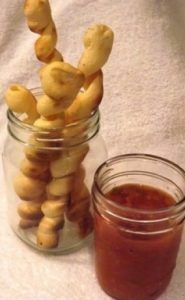 Rotate breadsticks every 3-4 minutes. Total grilling time is 10-12 minutes. Let cool, then remove from skewer. Serve with salsa, pizza sauce or marinara sauce.